Wolfsburg v Bayern kicked was in the shadow of a controversial press conference issued by the Bayern bosses Karl-Heinz Rummenigge, Uli Hoeneß and Hasan Salihamidzić. The question was how the players would react? The answer: despite being a man down for much of the second half Bayern were clinical and easily won 3-1. Despite all the media buzz, it was a measured start to the game by Bayern. 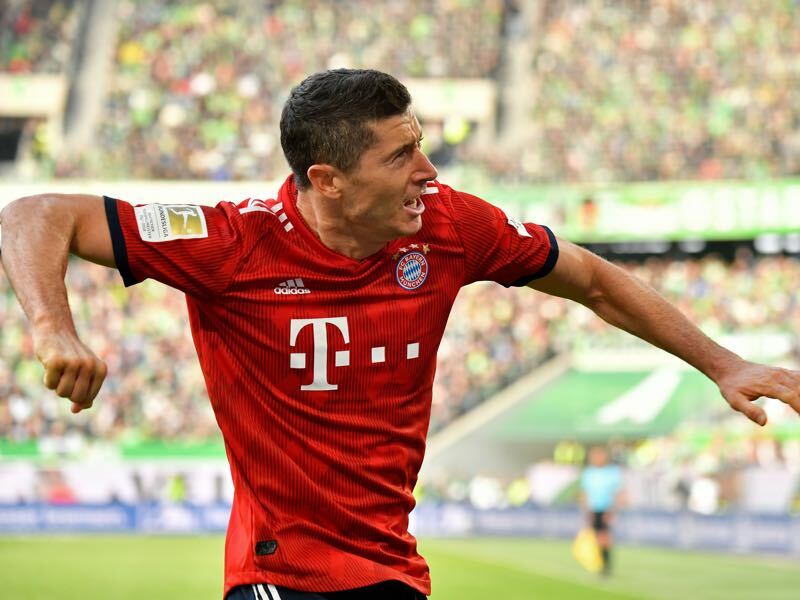 Der Rekordmeister did not produce a chance until the 12′ minute when Robert Lewandowski tested Koen Casteels with a freekick from 20 yards out. Bayern dominated possession, but Wolfsburg were not passive and tried to explore Bayern’s poor run of form early by pushing the Bavarians deep into the defensive third whenever winning the ball. Wolfsburg made it uncomfortable for Bayern. Nonetheless, Bayern created chances, Joshua Kimmich saw a curled effort saved by Casteels in the 22′ minute, and the Wolfsburg keeper was already at the centre of attention after making a double save in the 24′ minute keeping first Arjen Robben and then Robert Lewandowski from scoring with two great stops. At that point, the opening goal was only a matter of time, and it finally arrived in the 30′ minute. A through-ball by Mats Hummels found Lewandowski, who broke into the box and then beat Casteels with a shot through the keeper’s legs to make it 1-0. James should have then doubled the lead just a moment later but his close-range shot in the 32′ minute was directed around the post by Casteels. Wolfsburg were threatened to fall apart at that point. But die Wölfe managed to regain their shape and managed to escape with just the one goal down into halftime. Just after the break, Bayern doubled the lead. In the 49′ minute, Lewandowski was given to much space in the penalty box and easily beat Casteels to score his second. Bayern were cruising but then went a man down after Robben was sent off in the 58′ minute. The Dutch winger had been shown a yellow in the first half for a dive and after just one additional challenge was shown the door by referee Guido Winkmann. Want to see Bayern live? Book your European football travel now by visiting Nickes! How would Wolfsburg react? By scoring their first goal of the game. In the 63′ minute, Yannick Gerhardt sent Admir Mehmedi on his way, and the winger squared the ball inside the box allowing Wout Weghorst to score from close range. Wolfsburg seemed to have the momentum on their side. And Bayern? A man down but having the lead Bayern could have simply buckled down. 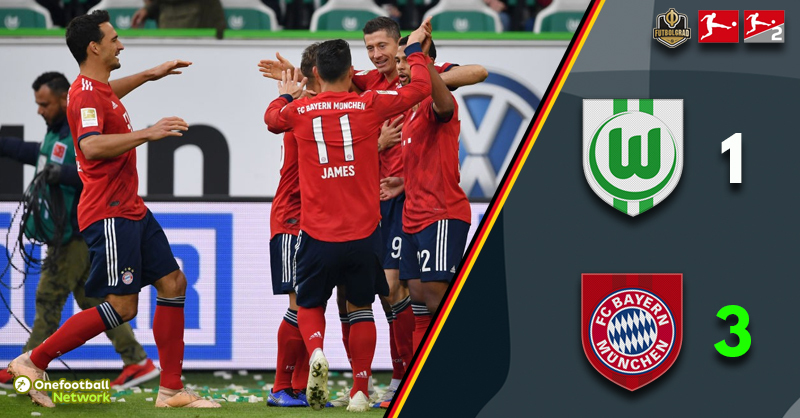 But instead, they continued with their positive game plan and regained a two-goal cushion in the 71′ minute after Lewandowski sprung lose James Rodríguez, who easily scored with a wonderful close-range finish. The goal essentially killed the game off. Despite being a man up, Wolfsburg from that point onwards were deflated and were unable to test Bayern keeper Manuel Neuer. Robert Lewandowski was the man of the match. The Polish striker has been struggling to find the net and was in some way the symbol of Bayern’s crisis. The 30-year-old striker seemed refreshed from the international break and was the difference maker today by scoring two goals and one assist to sink Wolfsburg. How would the players react to a controversial press conference issued by the Bayern bosses? Hoeneß, Rummenigge and Salihamidzić’s goal was to get the attention away from the pitch, and they certainly succeeded. But at the same time, there was no doubt that the attention would quickly shift back to Kovac and his players should Bayern’s poor form continue. A convincing performance against Wolfsburg, for now, should silence some of the critiques but the full-on media pressure is only one poor game away. Arjen Robben has received his first red card since April 2011 (vs 1.FC Nürnberg). Bayern have won the last 5 competitive at VfL Wolfsburg and scored 16 goals in those games (average 3.2). After three winless Bundesliga games, Bayern are back on track.